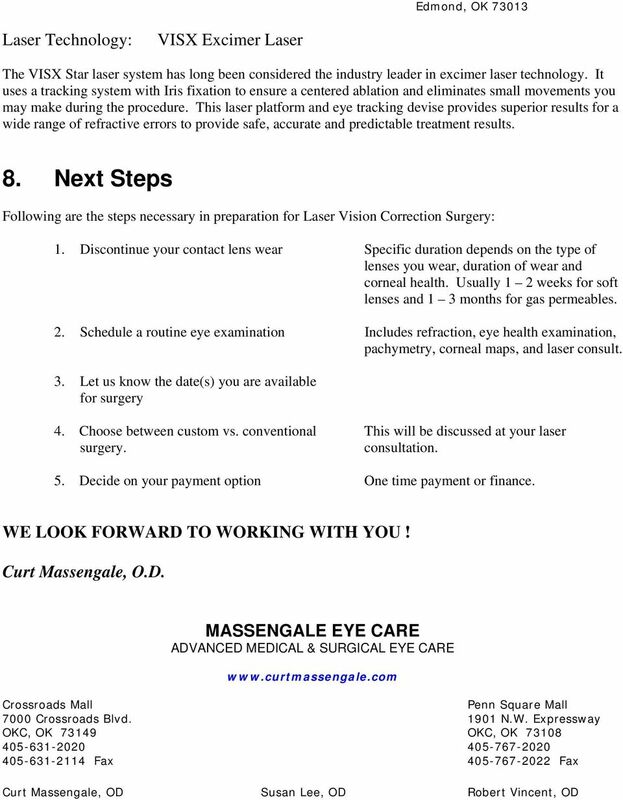 Download "MASSENGALE EYE CARE ALL ABOUT LASER VISION CORRECTION"
1 MASSENGALE EYE CARE ALL ABOUT LASER VISION CORRECTION 1. Understanding How Your Eye Works To decide whether laser vision correction (LVC) surgery is right for you, it is first important to understand how your eye works. The primary purpose of the eye is to focus light on the retina. If light doesn t focus properly, contact lenses or glasses are used to properly focus the light rays on to the retina. An eye works much like a camera. Light enters the eye through the cornea, travels through the pupil and the crystalline lens and is focused on the retina. 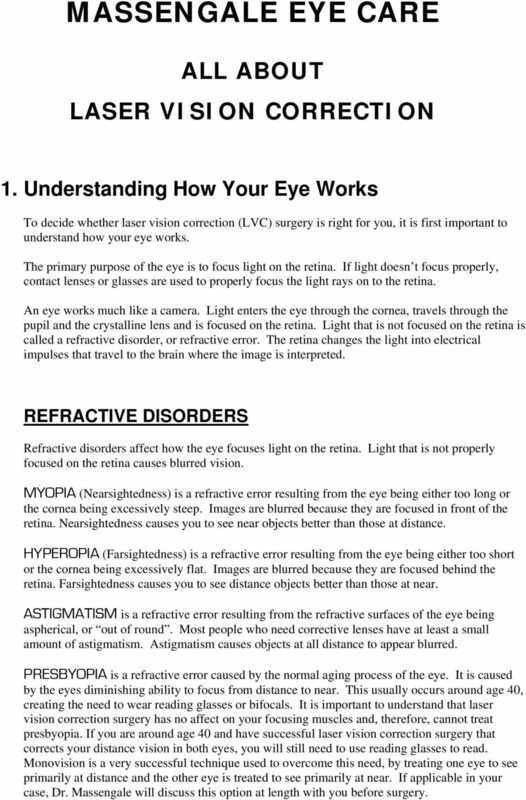 Light that is not focused on the retina is called a refractive disorder, or refractive error. The retina changes the light into electrical impulses that travel to the brain where the image is interpreted. REFRACTIVE DISORDERS Refractive disorders affect how the eye focuses light on the retina. Light that is not properly focused on the retina causes blurred vision. MYOPIA (Nearsightedness) is a refractive error resulting from the eye being either too long or the cornea being excessively steep. Images are blurred because they are focused in front of the retina. Nearsightedness causes you to see near objects better than those at distance. HYPEROPIA (Farsightedness) is a refractive error resulting from the eye being either too short or the cornea being excessively flat. Images are blurred because they are focused behind the retina. Farsightedness causes you to see distance objects better than those at near. ASTIGMATISM is a refractive error resulting from the refractive surfaces of the eye being aspherical, or out of round. Most people who need corrective lenses have at least a small amount of astigmatism. Astigmatism causes objects at all distance to appear blurred. PRESBYOPIA is a refractive error caused by the normal aging process of the eye. It is caused by the eyes diminishing ability to focus from distance to near. This usually occurs around age 40, creating the need to wear reading glasses or bifocals. It is important to understand that laser vision correction surgery has no affect on your focusing muscles and, therefore, cannot treat presbyopia. If you are around age 40 and have successful laser vision correction surgery that corrects your distance vision in both eyes, you will still need to use reading glasses to read. Monovision is a very successful technique used to overcome this need, by treating one eye to see primarily at distance and the other eye is treated to see primarily at near. If applicable in your case, Dr. Massengale will discuss this option at length with you before surgery. 4 The Evaluation Process The Laser Procedure Post-Operative Care THE EVALUATION PROCESS Before you proceed with laser vision correction, a thorough eye exam will be performed to determine if you are a candidate for laser correction. In general, you must be at least 18 years of age. Your vision must have been reasonably stable for at least a year, and you must be free from certain eye diseases. You should not be pregnant, nursing, or planning on becoming pregnant in the next 6 months and should be in good health. For contact lens wearers, we will provide you with a schedule for discontinuing your contact lens wear. In general, you should not wear soft contact lenses 2 weeks prior to your pre-operative examination. You should not wear hard or gas permeable lenses for at least 6 weeks, plus an additional week for each decade you ve worn rigid gas permeable lenses. This timetable for discontinuation of gas permeable lenses is a minimum. After this amount of time, we must have at least two consecutive visits with no change in corneal shape and prescription. During the evaluation process, your eyes will be carefully examined and you will be educated regarding all aspects of laser vision correction. It is vital for you to learn as much as you can about laser vision correction and have all your questions answered. This step is important in making an informed decision, and will help you understand what you can reasonably expect from the procedure. After determining your candidacy and having a comprehensive pre-operative work up, our staff will schedule your procedure at the laser center. At this point you will have had your refraction (prescription) verified before and after pupil dilation, corneal thickness measurements will have been taken, and had a topographical mapping of your eye. If your surgery is scheduled, you ll be given several prescriptions for eye medications to be taken before and/or after your surgery. Additional mapping and measurements may be taken at the laser center. After arriving for your procedure any additional questions will be answered so you will be completely prepared for your procedure and will know what to expect during and after your procedure. You will be given a mild sedative before the procedure. THE LASER PROCEDURE You should arrive at the laser center rested and relaxed approximately one (1) hour before your scheduled surgery time. Wear comfortable clothing, but DO NOT WEAR MAKE-UP, PERFUME OR COLOGNE, and expect to be at the center for about 2 hours. You will need to have someone drive you home after your procedure. When you arrive at the center, completion of all consent forms will be verified and you will be asked for payment for your procedure. TO BEGIN EACH PROCEDURE Anesthetic (numbing) drops will be placed in your eyes several times over the ½ hour prior to your procedure. You will enter the laser suite, where you will lie down on the laser table so that your eye is directly beneath the laser. An eyelid speculum will be placed so that you cannot blink the surgery eye during the procedure. 7 is not medically recommended. Ultimately, the decision for re-treatment will be reached cooperatively between the patient, surgeon and medical Staff at Omni Laser Center. Retreatment exclusions are: 1. Patients with pre-operative myopia greater than D (spherical equivalent) 2. Patients with pre-operative hyperopia greater than D (spherical equivalent) 3. 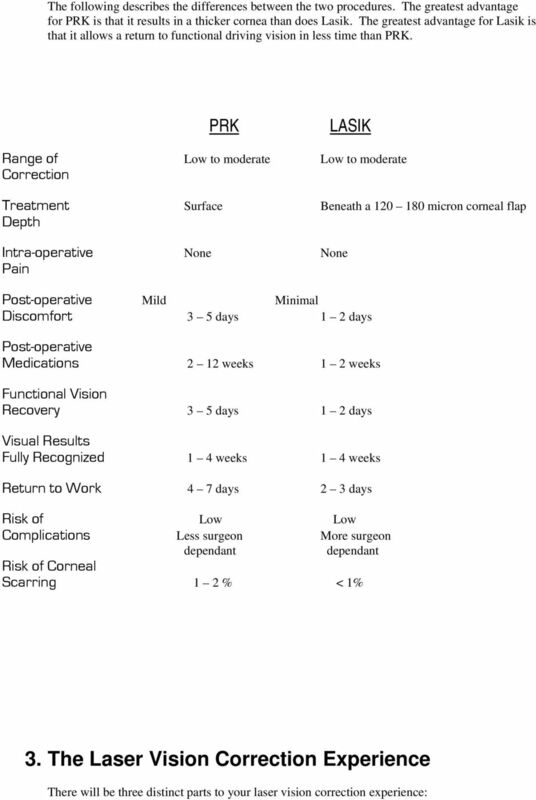 Patients with pre-operative astigmatism greater than 4.00 D. 4. Patients who fail to comply with post-operative guidelines. 5. Patients who fail to see a doctor at Massengale Eye Care for their yearly eye examinations, and if a re-treatment is considered, a subsequent follow-up with Dr. Massengale. 6. Patients whose loss of vision is a result of an accident or trauma to the eye. 7. Patients with diseases such as diabetes, active autoimmune or collagen vascular disorders. 8. Patients whose cornea is too thin for further treatment. 9. Patients whose vision is reduced due to irregular astigmatism. 10. Patients who underwent RK, ALK or any other refractive surgery prior to having LASIK or PRK at Omni Advanced Laser Center. 11. 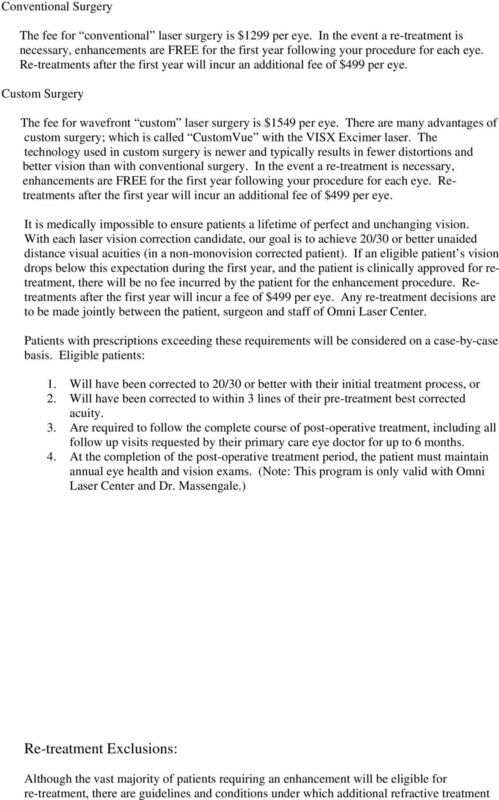 Patients whose initial PRK or LASIK was not performed at the Omni Laser Center. 12. Patients who develop an ocular disease such as (but not limited to) cataracts, glaucoma, diabetic retinopathy, retinal tear, detachment, or degeneration. 13. Patients seeking an enhancement as a result of developing presbyopia. 5. All about Dr. Massengale Curt Massengale, O.D. 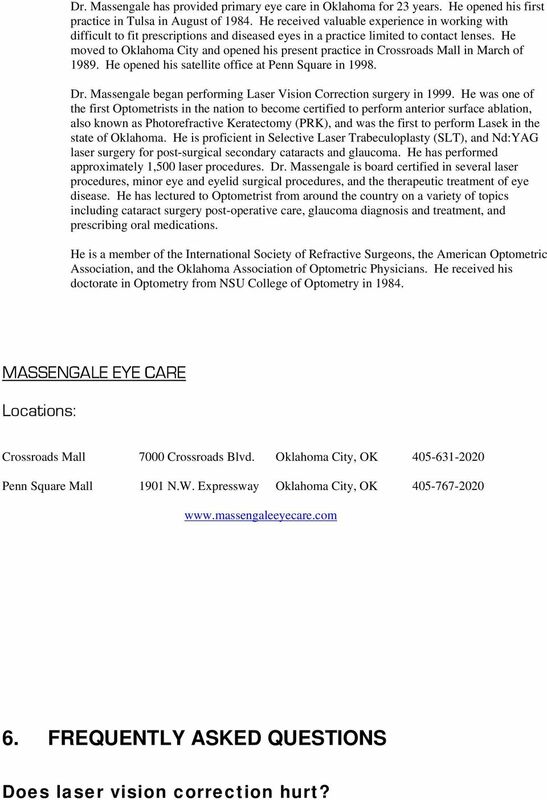 8 Dr. Massengale has provided primary eye care in Oklahoma for 23 years. He opened his first practice in Tulsa in August of He received valuable experience in working with difficult to fit prescriptions and diseased eyes in a practice limited to contact lenses. He moved to Oklahoma City and opened his present practice in Crossroads Mall in March of He opened his satellite office at Penn Square in Dr. Massengale began performing Laser Vision Correction surgery in He was one of the first Optometrists in the nation to become certified to perform anterior surface ablation, also known as Photorefractive Keratectomy (PRK), and was the first to perform Lasek in the state of Oklahoma. He is proficient in Selective Laser Trabeculoplasty (SLT), and Nd:YAG laser surgery for post-surgical secondary cataracts and glaucoma. He has performed approximately 1,500 laser procedures. Dr. Massengale is board certified in several laser procedures, minor eye and eyelid surgical procedures, and the therapeutic treatment of eye disease. He has lectured to Optometrist from around the country on a variety of topics including cataract surgery post-operative care, glaucoma diagnosis and treatment, and prescribing oral medications. He is a member of the International Society of Refractive Surgeons, the American Optometric Association, and the Oklahoma Association of Optometric Physicians. He received his doctorate in Optometry from NSU College of Optometry in MASSENGALE EYE CARE Locations: Crossroads Mall 7000 Crossroads Blvd. Oklahoma City, OK Penn Square Mall 1901 N.W. Expressway Oklahoma City, OK FREQUENTLY ASKED QUESTIONS Does laser vision correction hurt? 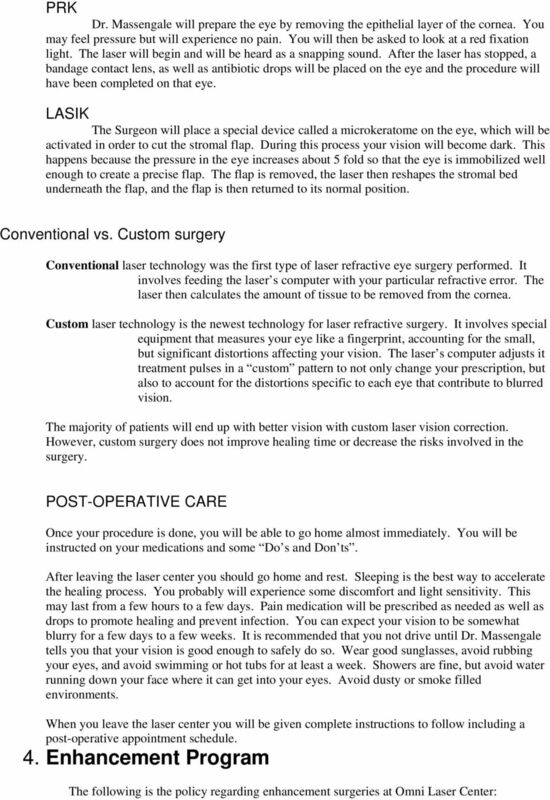 LASIK What is LASIK? Am I a good candidate for LASIK? What happens before surgery? How is LASIK done? Dr. Booth received his medical degree from the University of California: San Diego and his bachelor of science from Stanford University. Alexandria s Guide to LASIK A Community Service Project sponsored by: Wallace Laser Center Your Guide To A Successful LASIK Procedure The word LASIK is actually an acronym for Laser Assisted In-Situ Keratomileusis. LASIK. What is LASIK? Eye Words to Know. Who is a good candidate for LASIK? 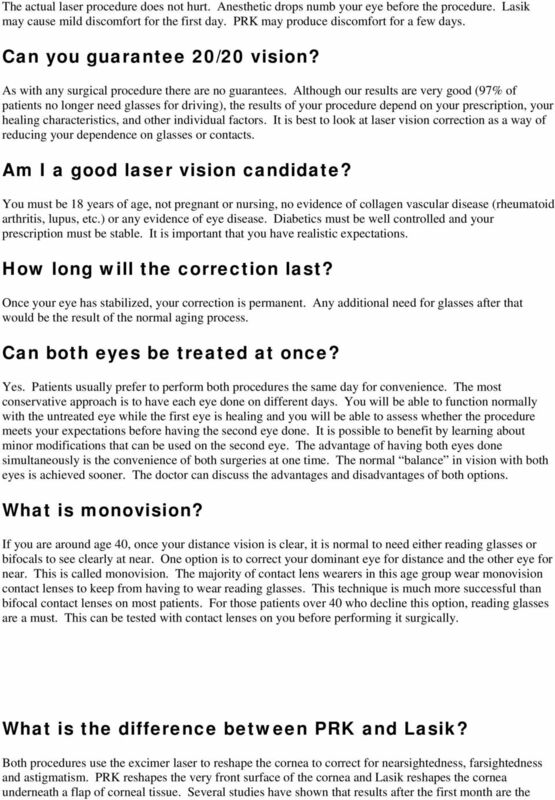 LASER VISION CORRECTION: WHAT YOU SHOULD KNOW. 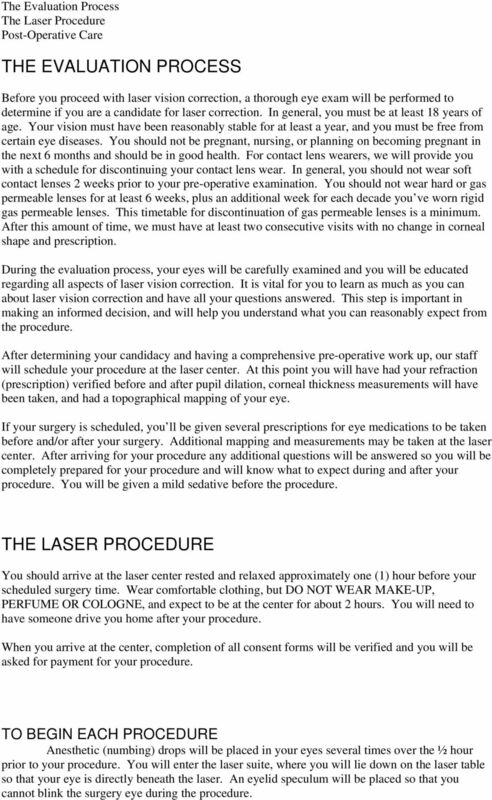 1 WAKE FOREST BAPTIST HEALTH EYE CENTER LASIK Consent Form 1. 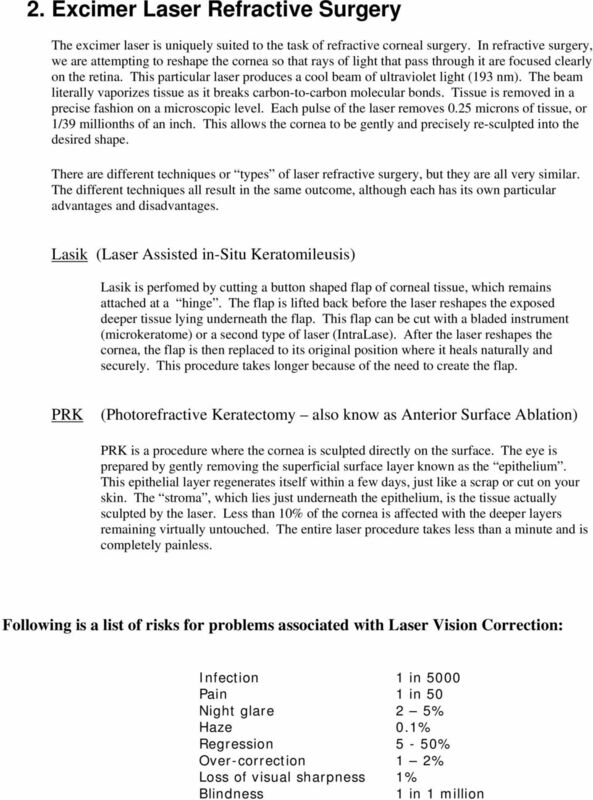 GENERAL INFORMATION The following information is intended to help you make an informed decision about having Laser In-Situ Keratomileusis (LASIK). 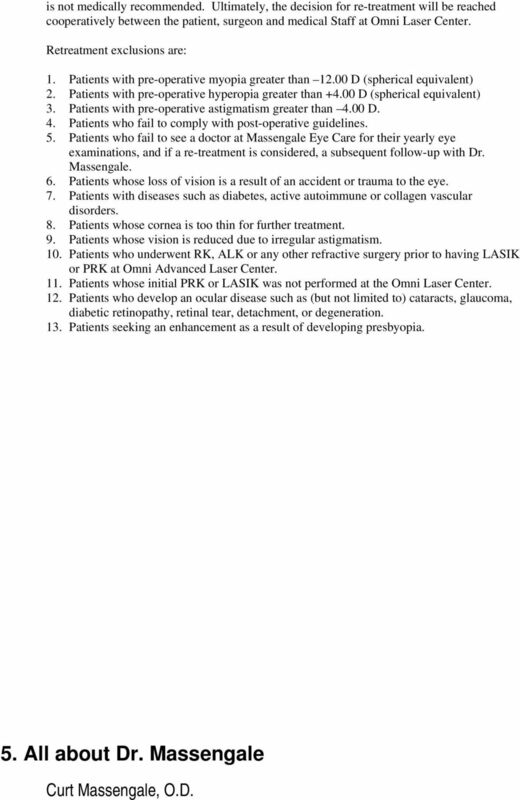 INFORMED CONSENT FOR LASER ASSISTED SUBEPITHELIAL KERATOMILEUSIS (LASEK)/PHOTO-REFRACTIVE KERATECTOMY (PRK) Please read the following consent form very carefully. Please initial each page where indicated. your bestchoice for Laser Vision Correction www.aucklandeyelaser.co.nz Auckland Eye is the Centre of Excellence for Laser Eye Surgery in Auckland Welcome to a life of freedom from contact lenses and glasses. ADVANCED SURFACE ABLATION (ASA) PRK / LASEK I. 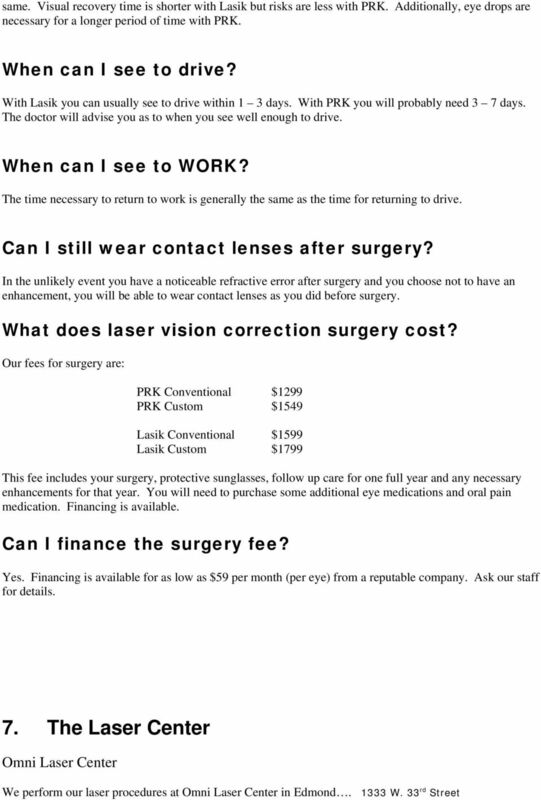 INTRODUCTION INFORMED CONSENT FOR PHAKIC LENS IMPLANT SURGERY This information is being provided to you so that you can make an informed decision about having eye surgery to reduce or eliminate your nearsightedness. INFORMED CONSENT FOR PHAKIC IMPLANT SURGERY INTRODUCTION This information is being provided to you so that you can make an informed decision about having eye surgery to reduce or eliminate your nearsightedness. We look forward to see you & thanks for trusting us your eyes to us. CONSENT FOR INTRALASIK CORRECTION OF NEARSIGHTEDNESS, FARSIGHTEDNESS, AND ASTIGMATISM USING INTRALASE TM TECHNOLOGY BY AMJAD KHOKHAR, M.D. Associated Eye Surgeons 45 Resnik Road, Suite 301 Plymouth, MA 02360 Henry J Kriegstein MD, FACS Board Certified Lois M. Townshend, MD, FRCSC Board Certified Kristin S. Kenney, OD LASIK CONSENT FORM I. Welcome to Eye Lasik We are delighted that you will be joining the ever-increasing number of people who have chosen LaserView to restore their vision. LASIK LASER VISION Are you seeking a Houston LASIK surgeon who is dedicated to excellence in ophthalmology? LASIK is a laser eye surgery procedure that can improve your vision and overall quality of life. Congratulations! You have just joined the thousands of people who are enjoying the benefits of laser vision correction.